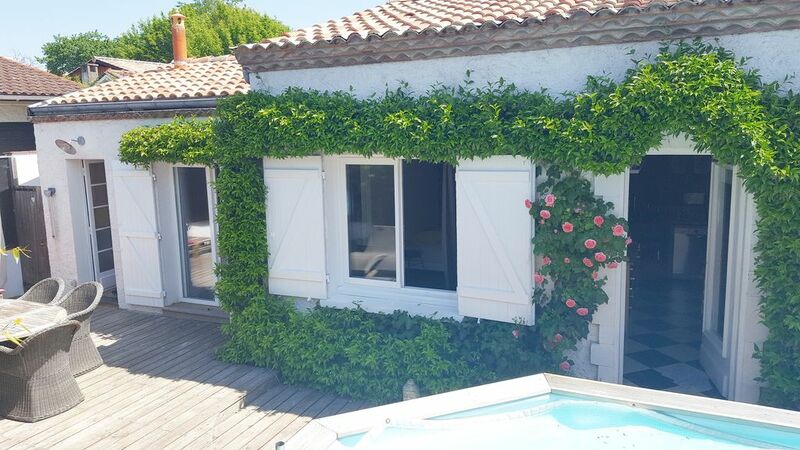 ideally located, and 100m from the beach and the port, this House any comfort, has the neat decoration, style campaign with the sea, is very luminous and very calm. with a large pine terrace of the moors, an outdoor toilet, a garden, 3 chairs, an above ground pool of 4 m. and a barbecue weber and her book of explanations and recipes. - Our old and still very mulberry for a nap under the freshness of its large leaves. we offer you peace, comfort, rest, sea and spray. -you hurry we are waiting by the fire! to go to the Logis de Tine. take the highway A 63 then A660 to Arcachon, you have arrived. the house is located in a quiet street, 100 meters from the beach, uncrowded during the summer and the port, which offers its water games (sailing, skiing, jet etc ...). 100m baker, pastry chef, butcher, grocer, cheese, street end the best Arcachon fish (the fish is very fresh). , Newsagent, restaurants, tourist home and possibility of bike rental). a free electric bus will take you for a tour of our beautiful town of Arcachon, or just to go to the station, market etc. 2 steps, a medical office (for small emergencies). possibility to park for free near the house (without automotive problems). inward: in the middle of the pool, two majestic observatories (the tchanquée) overlooking the island to the birds, the fishing village and its oyster parks. Arcachon is available in the colors of the four seasons, Spring City, Summer, Autumn, Winter, and is combined for all time. Blue, yellow, green and red. From January to December, the districts are drawn, to each his season, its people, its history, its heritage. Arcachon has four faces, one per city. Beach town on the Bay, was born of the sea air, the scent of pine trees, the train and the draft financial genius of the nineteenth century: the bankers Emile and Isaac Pereire ,. As of spring 1862, avenues and alleys are traced, casino and villas out of the sand. these dunes, the medical and business have created a true open sanatorium. And if the little tourist train ride we took to visit the city? 1-The City of Spring is its jetty la Chapelle, Notre Dame Basilica and Chapel of the Sailors, its beautiful old and famous seaside villas (Villa Alma, Yves St, St Christaud ) ... district full of history since the Emperor Napoleon III and his wife Egenie loved to stay there. The Chapel area was the site of royal villas, sumptuous boats: private dock allowed the rich and powerful to move from one to another with discretion and without interfering with fishing people and smelly roe fish. The waterfront between the Chapel and the Pereire Park offered a few years after the founding of the city, a panorama of sumptuous villas, competing wealth and elegance. the Abatilles is a residential area in the heart of the pine forest. Built in the middle of a park, the City of Spring has preserved green space and easy living. . The best example is the Pereire Park, ideal for walking and relaxation. The pine forest extends to the edge of the Arcachon basin to form the Pereire beach: a stretch of sand bordered by a long pedestrian promenade and a green sea garden. Emile Pereire had erected a large villa in a park that still bears his name. 'The Stables Pereire', topped with a beautiful clock, surviving evidence of this large villa. 2- The City Summer is a seaside tradition. Downtown and waterfront, Arcachon is no exception to the seaside tradition. Its beach, famous since the nineteenth century with the fashion for sea bathing by Empress Eugénie, takes its summer colors. beach clubs reappear for the happiness of children, the comings and goings of the incessant pinasses-walks accelerates, the terraces of cafes and restaurants are expanding and under their umbrellas, we savor a seafood platter. 3 piers, Thiers, and Eyrac Legallais, punctuate the walk to the seafront boulevard, it is beyond this avenue lies the heart of the city, with its market, stall colors and scents, squares, pedestrian streets and chic shops ... Installed at the pier Eyrac the prestigious Carrousel 1900 wooden horses waiting children. 3- the city of Fall L'Aiguillon has retained its identity as a former small fishing village; a typical area of ​​low houses with red tiled roofs and shutters of bright colors. Theater of nautical events, it is also the home port of many skipper T. Lamazou, R. Dinelli, Y. Parlier.